A little about us and our building that is now Brey's on Seventh. Sandy and Dan Breyfogle are the owners of Brey’s on Seventh. We often tell friends that owning this store is a bit of a dream that got mixed up in reality. We love the location right across from the Library square and appreciate the long history of the structure itself. Dan’s Dad, Melvin S. Breyfogle, operated his radio shop in this building from 1959 until his death in 2016. Although the building has changed hands our goal remain the same as those of Melvin. We want to offer fair pricing, good service, and a comfortable place to shop. We know there are many places to shop in today’s world, including the impersonal on-line market place. So we know that when you choose to visit us you had many other options and we hope to earn your business through our honesty and small town pride. Dan spent his working career in a variety of pursuits, including as a draftsman, carpenter, painter, and as a district manager with an electrical wholesaler. He also worked in a hardware store following an early retirement from the wholesale operation. Sandy has worked in a number of retail stores over the years including Gibson’s (now known as Pamida) in Estherville, TG&Y department store in California, and at a grocery store in Minnesota. She also worked as a day care provider and of course as mother and homemaker. We have lived on both coasts and in Taiwan during Dan’s US Air Force enlistment and several locations in Iowa. 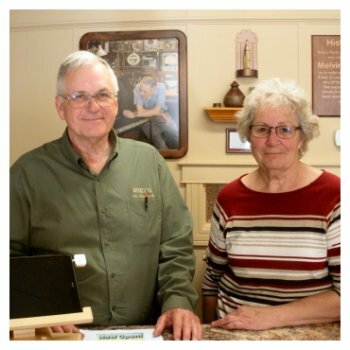 We left Estherville in 1969 but have always felt connected to the community as both of us grew up here and our family’s continued living here. We are so happy to have this connection with Estherville. If you would like to learn more about our historic building we have provided links below.